The Doctor and the TARDIS will appear in episodes 5 and 6 of the series, a two-part story. 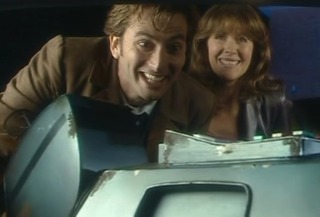 It has been previously reported that K9 would be taking on a much bigger role in the upcoming Sarah Jane stories; it’s not clear if he will also be appearing in these episodes alongside the Doctor, although obviously it would be very cool if he did. I suspect these two episodes might end up really feeling just like classic Doctor Who episodes more than anything we’ve seen since the original show went off the air. Considering SJA’s half hour format and the way that the show normally has multi-part stories with cliffhangers, just like the classic Doctor Who series, having the Doctor involved will cement the “Whoishness” of the show. It is filed under David Tennant, Doctor Who, K9, New Doctor Who, Sarah Jane Adventures, Sarah Jane Smith, Tenth Doctor.